VirtuaWin is a highly customizable virtual desktop manager that lets you organize applications over a two or more "desktops" with their own separate windows and applications (also called "workspaces"). The program can reduce distractions or help organize a cluttered desk space with too many windows open. Alternatively, a PortableApps version is also available. How to extract: Download the "portable" ZIP package and extract to a folder of your choice. Launch VirtuaWin.exe. Support for MS VC++ (Epress) 8 & 9+ (tested v10 2010). Corrected message sent for ALT key modifier for release. Somewhat patchy fix of unexpected crash. Dynamic taskbar support should probably be rechecked on newer win versions. Hung window (blinking icon) on Windows 10. This is best FREE+PORTABLE+LIGHTWEIGHT multi-desktop manager can manage up to 20 desktops. Much better than Despot, Monitors, Yo'3D. @MnX: Can`t you just add an entry to your start folder? Dexpot is a complete virtual desktop manager with up to 19 available desktops, Window catalog, various Preview modes, and window moving. The program also includes a variety of user interface improvements include managing window transparency, folding windows up into their title bar, right-click minimize to taskbar, and many more. 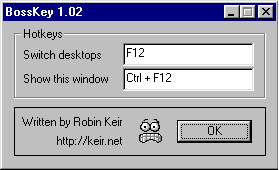 Taskbar Pager: Show desktop names as tooltips when hovering. Interpret command line arguments without a running Dexpot instance. Backslash was lost with network paths in 'Configure Desktops > Start-up'. DexControl: Improved window closing on excluded monitors. 1.5.11 version works OK on my win7x64. Who cares for all the glitter effects that can hog memory. It's real use is to organize screen clutter which it does very well. The biggest feature for me is having multiple desktops with different icons and wallpaper, screensavers, etc. Of course that's just one of many features available. Simply put one of the best virtual desktop managers around. My only complaint is that it requires admin rights. BossKey is a simple virtual desktop program. 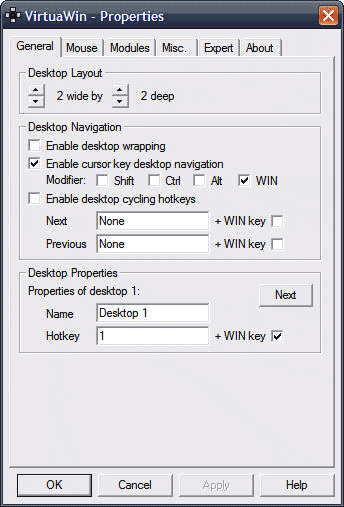 Create hot-keys to switch between the desktops and have one set of windows/applications on one and a different set of windows/applications on another and flip between them instantly with a single keypress. Up to 10 virtual desktops can be defined and windows can be designated always visible. How to extract: Download the ZIP package and extract to a folder of your choice. Launch bosskey.exe. "i accidentally assigned a hotkey that conflicted with one used by my file manager"